Movement engraved "Gudin lejeune [AP]aris"; dial painted "GUDIN LE JEUNE [AP]ARIS". 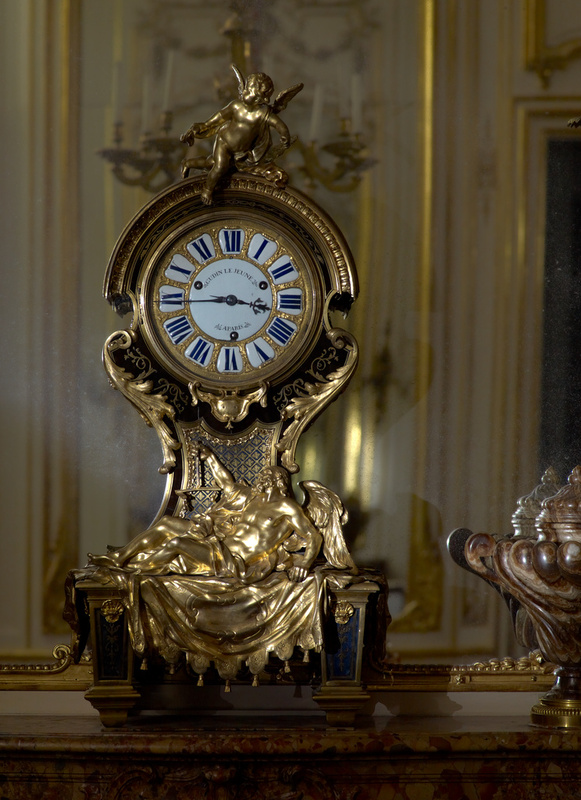 The figures on this clock represent Love conquering Time, a theme often repeated on French clocks of the early 1700s. The cupid balanced on the top originally held a long-handled scythe, an attribute of Father Time, who reclines below and holds his usual scales. The case's front and side surfaces are veneered with tortoiseshell, brass, and ebony. A recessed panel of blue horn, decorated with a brass trellis enclosing rosettes, is set below the dial. The legs are also set with panels of blue horn, which still retains its vibrant color. 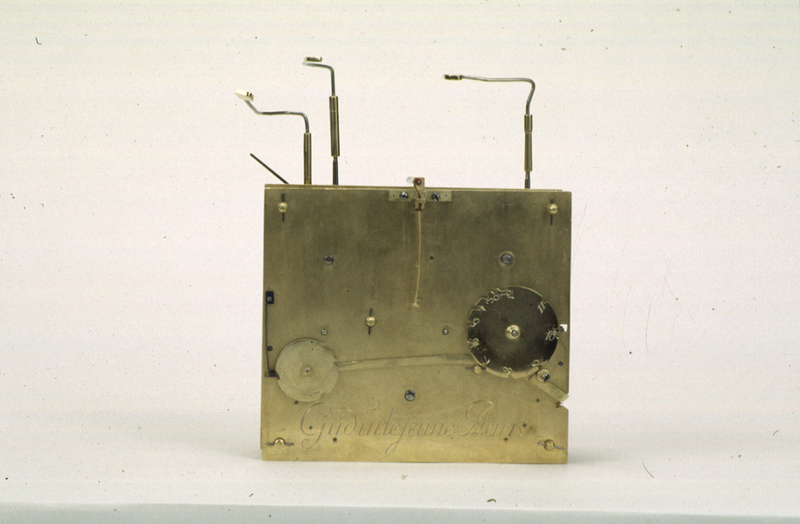 While the clock's dial appears to be contemporary with the case, the movement is not. The blank gilt-bronze cartouche beneath the face may once have held an enamel plaque inscribed with the name of the original movement maker. Later in the eighteenth-century, Paul Gudin set the present movement in the case and painted his name on the enamel dial. Count János Pálffy, Hungarian, 1829 - 1908 (Pálffy mansion at Král'ová pri Senci, Slovakia), by bequest to the Austro-Hungarian Empire, to be managed by the Ministry of Religion and Education of Hungary, given with the mansion at Král'ová pri Senci along with its contents, 1908. Austro-Hungarian Empire (Pálffy mansion at Král'ová pri Senci, Slovakia), distributed to the Czechoslovak Republic with the dissolution of the Austro-Hungarian Empire, 1918. Czechoslovak Republic (Pálffy mansion at Král'ová pri Senci, Slovakia), restituted to the heirs of János Pálffy, early 1920s. 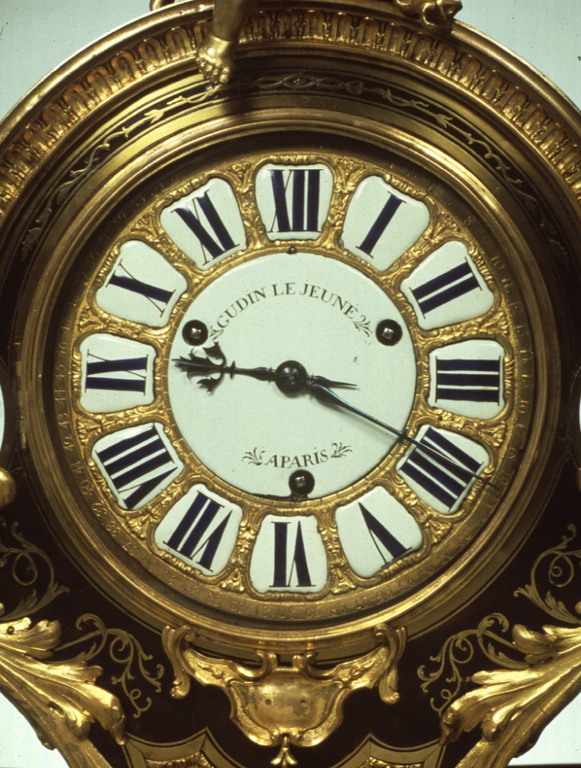 Source: In pamphlet for 1971 exhibition, "Haute Joallerie de France," clock is listed as owned by Étienne Lévy & Cie.
French and Company, Inc. (New York, New York), sold to the J. Paul Getty Museum, 1972. Fredericksen, Burton B., ed. The J. Paul Getty Museum: Greek and Roman Antiquities, Western European Paintings, French Decorative Arts of the Eighteenth Century (Malibu: J. Paul Getty Museum, 1975), pp. 140, 145, 150, ill.
Wilson, Gillian. 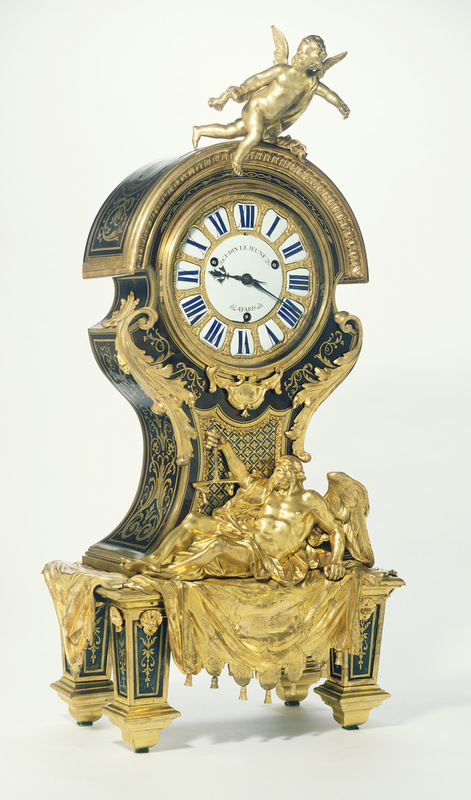 Clocks: French Eighteenth-Century Clocks in the J. Paul Getty Museum (Malibu: J. Paul Getty Museum, 1976), pp. 22-25, no. 4. Wilson, Gillian. Decorative Arts in the J. Paul Getty Museum (Malibu: J. Paul Getty Museum, 1977), p. 16, no. 17. Miller, Carole Ann Lyons. "Clockwise Special Report: The J. Paul Getty Museum." Clockwise (August 1979), pp. 18-19, fig. 4. Smith, Alan, ed. The Country Life International Dictionary of Clocks (New York: Putnam, 1979), p. 90, fig. 6. Edey, Winthrop. 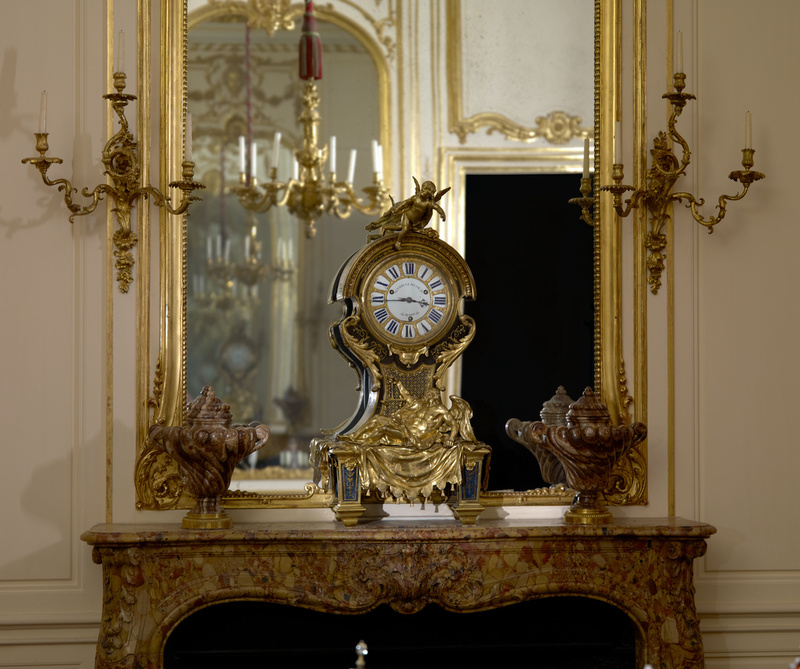 French Clocks in North American Collections (New York: Frick Collection, 1982), p. 45-46, no. 38. Schwartz, Marvin D. "Boulle Furniture." Art and Antiques 6,no. 2 (April 1983), p. 75, ill.
Edey, Winthrop. "Time for Boulle." House and Garden (March 1985), p. 82, ill.
Ottomeyer, Hans, and Peter Pröschel, eds. Vergoldete Bronzen: Die Bronzearbeiten des Spätbarock und Klassizismus. Vol 1, Katalog der Bronzearbeiten (Munich: Klinkhardt & Biermann, 1986), p. 40, fig. 1.2.5. Sassoon, Adrian, and Gillian Wilson. Decorative Arts: A Handbook of the Collections of the J. Paul Getty Museum (Malibu: J. Paul Getty Museum, 1986), pp. 36-37, no. 78. Ottomeyer, Hans, and Peter Pröschel, eds. Vergoldete Bronzen: Die Bronzearbeiten des Spätbarock und Klassizismus. Vol 2, Beiträge zur Geschichte und Technik der Bronzearbeiten, zu Künstlern und Wekstätten (Munich: Klinkhardt & Biermann, 1986), p. 478. Wilson, Gillian. "A Secretaire by Philippe-Claude Montigny." The J. Paul Getty Museum Journal 14 (1986), p. 123, fig. 3. Bremer-David, Charissa, et al. Decorative Arts: An Illustrated Summary Catalogue of the Collections of the J. Paul Getty Museum (Malibu: J. Paul Getty Museum, 1993), pp. 85-86, no. 132. Wilson, Gillian, et al. European Clocks in the J. Paul Getty Museum (Los Angeles: J. Paul Getty Museum, 1996), pp. 20-27, no. 4. Wilson, Gillian, and Catherine Hess. Summary Catalogue of European Decorative Arts in the J. Paul Getty Museum (Los Angeles: J. Paul Getty Museum, 2001), p. 68, no. 132. Harwood, Buie, Bridget May, and Curt Sherman. Architecture and Interior Design through the 18th Century: An Integrated History (Upper Saddle River: Prentice Hall, 2002), p. 392, no. 23.12, pl. 56. Wilson, Gillian, et al. French Furniture and Gilt Bronzes: Baroque and Régence: Catalogue of the J. Paul Getty Museum Collection (Los Angeles: J. Paul Getty Museum, 2008), p. 370, app. no. 7. Scott, Katie. "Figure and Ornament: Note on the Late Baroque Art Industry." 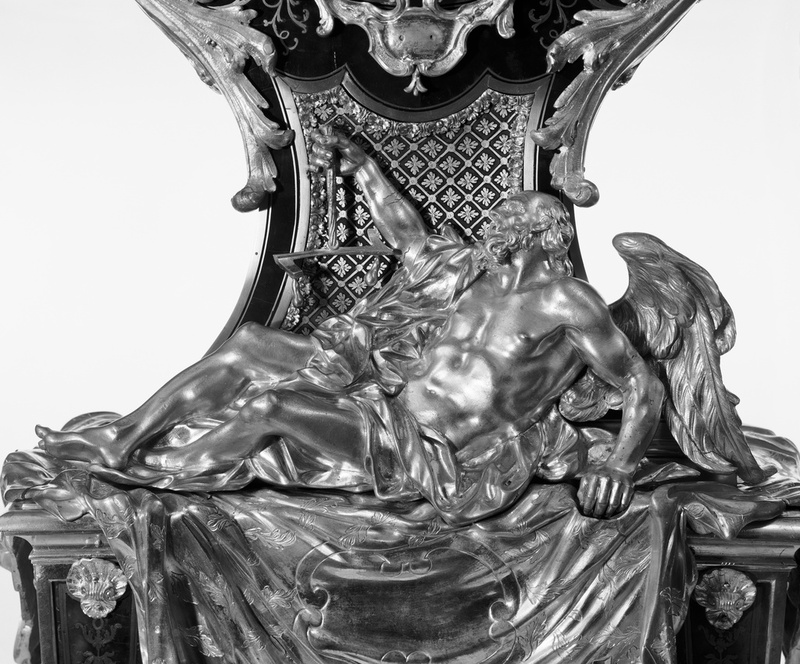 In Taking Shape: Finding Sculpture in the Decorative Arts, exh. cat. Martina Droth et al., eds. (Leeds: Henry Moore Institute; Los Angeles: J. Paul Getty Museum, 2009), p. 169, fig. 2. Bremer-David, Charissa, ed. Paris: Life & Luxury in the Eighteenth Century, exh. cat. (Los Angeles: The J. Paul Getty Museum, 2011), pp. 24-25, fig. 13, p. 91 (detail), p. 118, no. 16.